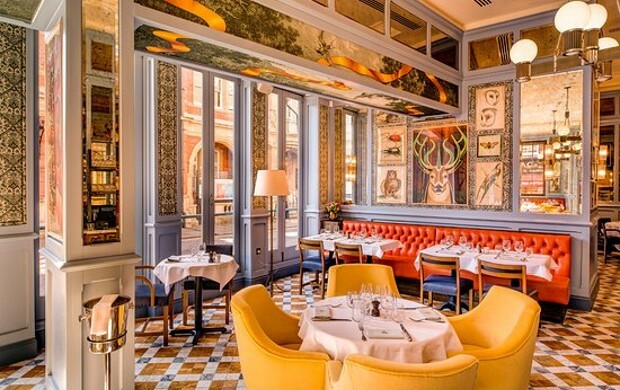 A colourful, no-expense-spared take on classic brasserie decor: think Zedel reimagined by a flamboyant, semi-mad genius with an unquenchable thirst for marble, mirrors, bright orange upholstery… and a strange penchant for wildlife. It’s fab. Tangerine leather stools line the gleaming, marble topped bar, while comfortable fat banquettes in the same carroty hide clash gloriously with vivid purple-blue mid-century dining chairs and mustard-yellow bucket seats. There are some rather wonderful stained glass windows celebrating the restaurant’s proximity to Richmond Park (a deer’s head with towering antlers sticks in the mind), mirror-panelled pillars painted a faded lilac, large, low-hanging multi-globe chandeliers. The whole dazzling effect is tempered by starched white linen, wall lights emitting a soft glow, and a pleasing abundance of mismatched paintings and drawings of bird and animal life. A week after it opened in March, the place was buzzing—full, with over a hundred covers, our waiter told us—and I imagine the initial, presumably significant, outlay has already been recouped. The Ivy has a winning formula, and the tweaks that mark out the individual branches (here the references to the park) lend an idiosyncratic charm not often found in restaurant chains. The friendly, polished staff take pride in their work and the result is a confident, happy place where you can sit back and relax for a few hours, knowing that few, if any, dud notes will tarnish your enjoyment. The evening we visited, quite a lot of 30- to 50-something women, mainly blonde, gossiping and laughing (it’s the sort of place that makes you want to dress up a bit—though it wouldn’t matter if you didn’t); nicely shod and coiffed grandparents with well-mannered teenagers clearly angling for a bung; almost-raucous mixed groups of young professionals; contented-seeming couples. In the daytime it’s popular with west London ladies who lunch. A couple of weeks ago, my mother (ex-Chelsea, recently moved to the Home Counties) and aunt (still defiantly Chiswick) decided to check it out, unprompted by me. Reports were largely positive. I should think it’s a huge hit with locals, and if I lived in Richmond I’d be popping in regularly. But from Notting Hill Gate—well, all I can say is damn you, District Line, with your myriad branches and endless unexplained waiting on draughty platforms. As you might have surmised by now, of a uniformly high standard. Ravenous after our hellish, ludicrously delayed journey, we fell on the seriously yummy truffle and parmesan arancini pre-starters. Gooey within, crisp without, the heady umami of bosky fungus and tangy cheese in the rice balls soon put smiles back on our faces (the wine might have helped too). Sourdough bread, warm from the oven, reminded me only ever to give up carbs on a temporary basis. 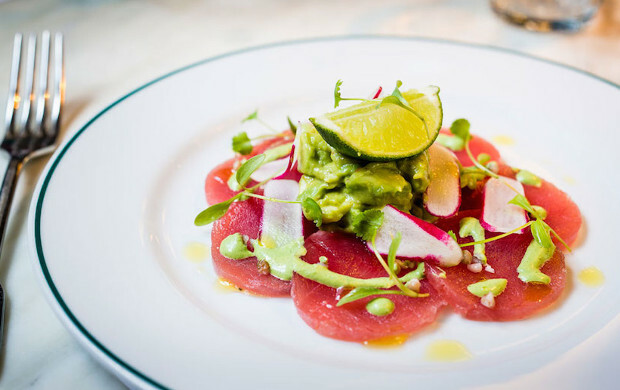 My scallops were perfectly cooked, just the right ratio of caramelisation to wobble, Andy’s translucent tuna carpaccio fresh and lovely with lime, avocado and slivers of peppery radish. To follow, I went for plaice—fine of flesh, full of flavour—with a green salad fragrant with soft herbs. Andy’s slow-cooked shoulder of lamb with a rich vinous jus was really bloody great, the meat pulling apart with wonderful ease, yummy juices demanding more mop-up carbs, this time in the form of buttery, silky smooth pomme puree. As we both wanted to try both, we shared a couple of puddings: a chocolate bombe with vanilla ice cream and honeycomb centre, with hot caramel sauce that soon started to melt the crisp dark shell; and lemon meringue Alaska, a cross between lemon meringue pie and baked Alaska. Both lip-lickingly scrumptious, the precarious hot/cold balance evidence of a very skilled pastry chef. As one might expect, the wine list is extensive, meandering pleasingly through the Loire, Bordeaux and Rhone, through Piedmont, Rioja and Tuscany, all the way to Coonawarra, Stellenbosch and Marlborough—now that would be a fun (if needlessly circuitous) trip. Prices range from a Grenache Blanc from the Languedoc at £19.50 to a Tuscan Sassicaia, Tenuta San Guido at a slightly more eye-watering £340. So something for everyone—breakfast, brunch, lunch, afternoon tea (who really does that? ), dinner, all executed extremely competently. I’ve only given it four stars as it’s slightly formulaic. But great formulaic is so much better than mediocre innovative, any day.